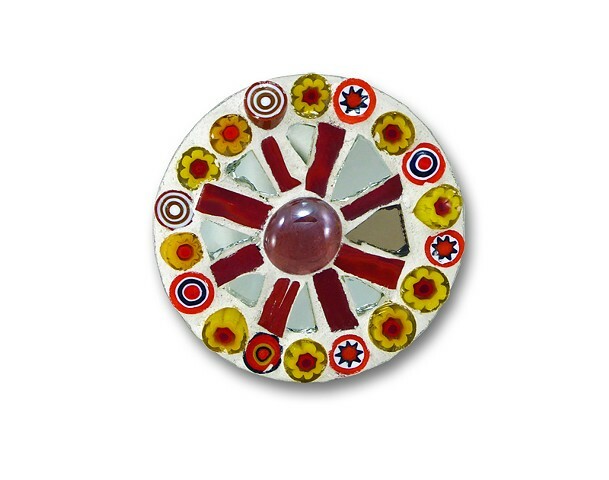 Big Brooch is suitable for use on a coat, hat, shawl or bag. “I am now retired from working on large public art projects, often involving schools and other community groups, due to age and mobility problems, but I still enjoy creating smaller work, using alternative and found materials; pebbles, crockery, mirror, combined with the more conventional glass and ceramic". As a long time member of the British Association for Modern Mosaic, Ilona exhibits nationally. Other major exhibitions included ‘Art in Ruins’ and ‘The Labyrinth’ an international sculpture exhibitions at Dudley Castle, and ‘Sitting Pretty’ an international exhibition of women’s art at The Coventry Gallery, London. One of Ilona’s sculptures is in Conoco’s corporate collection.